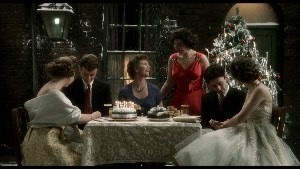 Terence Davies’ autobiographical 1992 The Long Day Closes is an odd film that requires patience and repeated viewings to appreciate. Even then, any given viewer could be forgiven for wondering why this particular British indie has had so much praise lavished upon it over the years. That’s not to say it’s not worthwhile, just that the film has a distinct lack of dramatic tension – it just sort of floats by almost passively, encouraging the audience to respond in kind. The Criterion Collection has issued a carefully restored Blu-ray/DVD edition featuring insightful commentary by Davies and his director of photography, Michael Coulter. Honestly, for better or worse, Long Day is the kind of film where any context or guidance from its creators is welcome in order to adjust to its unique approach. 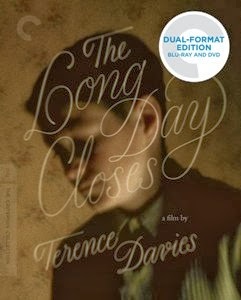 Essentially free of any conventional plot structure, The Long Day Closes is an exercise in memory and nostalgia focusing on Bud (Leigh McCormack), an 11-year-old boy in Liverpool, England. He’s an outsider, even within his own family to a large degree. His brothers and sister are considerably older than him. Only his mother (Marjorie Yates) seems to share an emotional connection with him. But even that feels clouded by the absence of her deceased husband. Bud is bullied at his new school, only finding refuge at the cinema – which he attends at every possible opportunity. While all of that may conjure thoughts of a wide variety of past cinematic memoirs, Davies’ style is all his own. His film takes an almost impressionistic approach, offering mostly fragments that don’t add up to any recognizable catharsis. This isn’t a coming-of-age tale as it’s normally known. The “long day” of the title seems to refer to a period in Bud’s life, covering a fleeting period of happiness just before the onset of young adulthood. Subtly suggested throughout is Bud’s realization that he is homosexual. Arguably the only overt signifier of Bud’s sexuality is his innocent ogling of a shirtless male bricklayer early on. Even that is dealt with in such a nondescript manner, any viewer would be forgiven for completely missing its significance (I did, the first time I watched it). Davies uses a variety of music (mostly standards like “Stardust” or traditional pop like Debbie Reynolds’ “Tammy”) and even audio clips from other movies to assemble a collage of specific recollections. Bud is seen being smacked around by his school headmaster, checked for lice by the nurse, and a variety of other relatively mundane activities. It’s not a typical “story” and no overt message is delivered. It’s simply a series of slightly idealized fragments (Davies tells us in the commentary how precisely he remembers much of what’s onscreen, though we also know memory tricks us by changing over time). After my first viewing (recently, via this release, having not been previously aware of the film) I was utterly non-plussed. But giving Criterion the benefit of the doubt, I spent some more time with it. 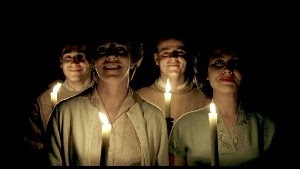 The film has grown more hypnotic over multiple viewings, with key moments sinking in upon further reflection. The naturalistic performances of star McCormack and Yates achieve a rare level of unforced poignancy. In addition to the commentary, Criterion’s edition includes (on both the Blu-ray and standard DVD) two new interviews. One is with production designer Christopher Hobbs and the other is with executive producer Colin MacCabe. A vintage piece, a 1992 episode of The South Bank Show, includes a great deal more discussion of the film and its background by director Terence Davies.